Ever come across the term Half Panama and wondered what on earth it means or is referring to? Half Panama is sturdy cotton fabric that has been woven with two threads in parallel instead of one. This creates a fabric which is heavy duty yet lightweight and easy to clean. 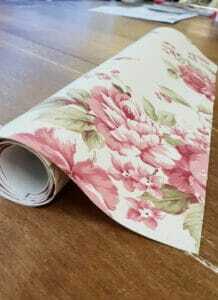 Particularly suitable for curtains and roman blinds, this fabric base cloth is often used for high quality prints. An example we have in stock is this lovely geometric print which is available in two colourways, blue and orange. Ticking was originally made from a tightly woven cotton or linen that was used as a feather proof fabric to cover bedding such as pillows and mattresses and was a more practical utilitarian cloth, it is known to be mainly neutral with a distinctive muted coloured stripe design, usually brown, blue, grey or sometimes red or yellow. However, this fabric has been included in many modern design ideas and is also now used for a wide range of things including cushion covers, curtains, curtain lining, upholstery and can be used to give decorative touches in interior design and many other things. Some tickings have a wider width, making them useful for items where you don’t want a join, such as bed covers or tablecloths. The classic ticking design now comes in many more colours and can be found in a range of weights allowing its uses to be almost endless but still giving that classic simple look that is very effective. Look at this wonderful idea of using ticking to line a pair of shepherd hut curtains, with gorgeous Scandi design fabric click here to have a look! We have a wide range of ticking here at Livingstones in many different colours with the classic stripe and a few others that are slightly different variations on the classic look but still give the feel of ticking to a room or any project. Buckram is a narrow, stiffened cloth that is usually coated with a glue backing, this can be ironed onto fabric to give it support and rigidity, this is called fusible buckram. It is used in the same way as iron on interfacing in this respect, however it comes in narrower widths compared to this and is much thicker and therefore stiffer. It is mainly used in curtain making for pelmets or to stiffen the headings of curtains when making pinch pleat curtains for example. The buckram is hidden between the layers of fabric when used in this way, this helps the pleats keep their form. We stock fusible buckram in widths of 4″, 5″,6″ and 12″. The different widths are available to suit the curtains so that the right look can be achieved for the room. You can browse a selection of fabrics suitable for curtain making below, click here for the full range of curtain fabric available online, or visit either of our shops to discover thousands of metres of fabric to take home the same day as well as samples of fabrics available to order. Linen is a natural fibre that is made from the flax plant. It is durable and is well known as a cool fabric, making it great to wear next to the skin in hot weather as the weave allows air flow through the garment, its cooling properties are also due to the fact that the fibres are very absorbent, so wick sweat away from the skin quickly allowing it to evaporate away with cooling effect. Linen is often used for bedding and clothing due to its unique cooling properties. Flax plants are mainly grown throughout Europe with certain countries being known for producing finer quality flax, due to better growing conditions for the plants. Some of these countries include Ireland, Belgium and Russia. Flax plants are usually harvested by pulling the plant up from the root rather than cutting it down, as the fibres run all the way up through the plant from the root, so pulling them up keeps the fibres long. This is either done by hand (usually more expensive cloth comes from this) or a machine similar to a combine grabs the plants and pulls them out. Once the flax plants have been harvested they are left in the field to undergo retting or alternatively they can be taken, a process where the inner stalks break down to leave the straw outer and the stalk fibres that can be processed and turned into linen. These remaining fibres are then threshed to remove the seeds (linseeds) which can then be used for oils or the seeds themselves. The remaining plants are then processed to remove the outer straw from the fibres to make the remaining fibres supple and ready to be spun into linen. Linen is one of our favourite fabrics at Livingstone Textiles, and is loved by our customers who are fans of natural fibres. We have a selection of linens available to buy online, and even more in our stores in Bridport Dorset and Yeovil Somerset. Quite a few young and older women are discovering the liberating comfort of the Bralette. Many of them are made from supersoft polymide and elastane and are just unbelievably comfortable to wear however some of the really pretty ones can be fairly pricey, especially if you have a love for lace or back detail. We came up with a little idea to give you the expensive look without the price tag. Go and grab yourself a couple of bralettes from any of the discounted clothing shops and add some of our stretchy lace to the bottom panel. You only need around 80cm for one bra and at 145mm it is good and wide to extend as a sheer panel over your rib cage. It’s priced at £2.75 a metre and we stock it in both white and black. Viscose is a man-made fibre that is manufactured from a plant-based material called cellulose and is typically made from woody plants, such as trees and bamboo. It is a low-cost fabric and has many of the desirable qualities of more luxurious fabrics. It is used to make clothing because it is breathable, drapes well, is highly absorbent and does not trap body heat. Because viscose is made from renewable plants, it is frequently cited as an environmentally friendly fabric, particularly when bamboo is its source. Viscose can be blended with other fabrics such as linen to get the benefits from each cloth at a lower cost. Viscose and viscose blended fabric are great for this time of year being cool and lightweight. We have a range of viscose fabrics in bright colours and patterns, as well as linen blends. We are so excited to finally be stocking this professional dressmakers curves. It’s taken a while but we’ve managed to source one of excellent quality from Prym because some things are worth paying a bit more for. This investment in your sewing apparatus will assist you in altering patterns by transferring your measurements on to a bought pattern because you can then shape it to your waist and out to your hip measurement on the pattern and draw in your own personal shape, ensuring a really professional fit when you finish the garment. It’s also brilliant for pattern drafting. This is when you take a block and manipulate it to create your very own dressmaking pattern. All items of clothing are made by starting with a basic pattern block that is added to. If you dressmake then you are probably already making adjustments to the pattern to create a good fit, after all looking good in a handmade garment is firstly about Fit and secondly about wearing what you want to wear. By creating your own personal pattern block you can always start with a good basic pattern from which you can design in any style you choose. Using a dressmakers curve you can create sleeve curves, hem curves and armhole openings as well as hip shapes and waist curves. Its not just for dresses either, you can use your dress block to also design your own skirts, blouses and tops. What is a block? Well, a block is a personally tailored pattern for a very very basic dress or pants. It has no style details at all so it’s a blank page waiting for your design. Starting with the basic outline shape, you make adjustments to the block using your own measurements to achieve an absolutely perfect fit. You then use the block as a starting point for every single pattern you create, knowing you won’t have to make any size adjustments at all because you’re starting with your own bespoke shape. You can add in style and shape by slashing and spreading to create fullness in a skirt, add ruffles, a neckline shape or by adding darts to pull a shape in for a closer fit. Once you’ve created your block you can let your imagination go free with the creative detail, knowing its totally unique to your figure. To buy your dressmakers curve you can either pop in to your nearset branch of Livingstone’s or contact us and we’ll mail one out to you. These cushions are new in and are a good way to add extra support where it’s needed. They can be used as extra padding when reading in bed or in a chair and can also be used help to make a sick or elderly relative much more comfortable when eating if they are prone to slipping sideways. It eliminates the need for lots of pillow stuffing to keep them upright. Made from our top quality polyester wadding by our man in Devon, this locally made product can also be laundered in the washing machine. The V shape makes it ideal as a sleep support as it fits easily between the knees and can help if you suffer from aching legs at night as well as being invalubleif you are pregnant and struggling to get comfortable. When baby is born, it makes an excellent support for breastfeeding mums as you can prop baby at excatly the right height and angle to latch on properly. And when baby get bigger you can use the V cushion to support him while you play together. We tried the V cushions at work and found them so super comfy that we’ve named them the Livingstones Zen Cushion. Delightful country gent (and lady) style ribbons are now in stock. Featuring some really great designs of cows, pheasants and lovely stags, all on vintage coloured satin ribbons, this collection is sure to reflect a flavour of the rural westcountry on your gift or project. We’ve got cheeky little foxes to raise a smile and as we launch into a season of rural and farming shows, these pretty cows would grace a gift of hand made local cheese. The more exotic sounds of india can be heard echoing in these gorgeous peacock ribbons and could be used to wrap a gift of spices from your travels this summer. Come into Livingstone Textiles and see one of the largest ribbon resources in the region. Note: your batten should already be in place and should also have the Velcro and eyelets attached at this point. If you have had your blind made by us then your it should already be threaded with cord. However, if you find you need to thread the cords then follow these instructions. Lay the blind down on a clean table/surface face down. Next thread the cords though the eyelets from the top of the blind to the bottom and secure them by threading through the safety device. You now need to decide on which side of the blind you would like the pull cord to be on for opening and shutting the blind as this will affect the direction the cords. Secure the blind onto the batten by pressing the Velcro together. You should now thread the cords through the eyelets on the batten starting with the corresponding eyelet for each line of cord, either work left to right (cord will hang on the left) or right to left (cord will hang on the right). Thread all of the loose cords through your wooden acorn to keep them together and tie a loose knot to stop them slipping back through. Do not cut the excess cord off at this point. In order to ensure you have the correct length of cord pull the blind up and down a few times to make sure it runs level. To determine where to cut the cord you should let the blind hang all the way down so that the acorn will be at its highest point you should have a short distance between the last eyelet on the batten and the acorn. Tie a small knot here to keep the cords together and then cut off the excess, the knot should be hidden inside the acorn when it is pulled down over it. If you have found that your blind has moved slightly after doing this and is no longer level, you can fix this easily by tweaking the length of the cord, by pulling it through the safety devices on the bottom of the blind, making where it hangs longer or shorter. The cleat should be secured next to the blind cord at least 1.5m above the floor, this is to reduce the risk of small children getting the cord caught around their necks which could lead to strangulation. The cleat requires two screws to be screwed through it and into the wall (or other fixing point) in order to secure it. Safety note: When the Roman Blind is pulled up the cord must be fully wrapped around the cleat, so that there is no excess cord hanging down for small children to be able to reach. Look out for this useful stuff in our shops! Fray Check is a colourless liquid that stops fraying by reinforcing the fibres.It can be used to prolong the life of garments by reinforcing stressed areas like button holes, seams, collars and cuffs against the wear of day-to-day use. For more creative projects, Fray Check can be used when sewing curves to seal the edges, to give rolled seams a stable finish, or to seal the edges of fabric for craft projects like motifs. The finish is washable, and can be repeated if needed. Find out on this video.